Keywords: Atomization, emulsions oil in water, stability, two-fluid nozzle. The atomization of oil in water emulsions is used in the food industry such as in the preparation of capsules, films and coatings among others. However, the passage through the atomization devices could have an influence on the properties of the emulsion and, consequently of the final product. In the present work, it was evaluated the influence of two fluid nozzles of different dimensions on stability parameters of oil in water emulsion produced by microfluidization and using gum Arabic as wall material. Results indicated that the droplet size, the polydispersity index and the Turbiscan stability index of atomized emulsions were affected by and Oswald ripening mechanism as compared with those of the original emulsion. 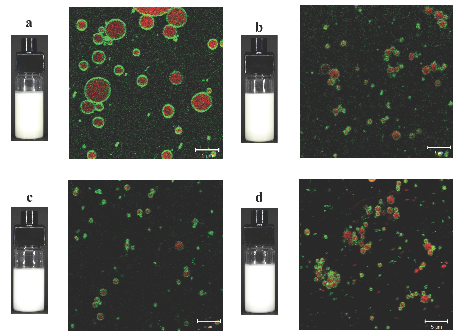 The confocal laser scanning microscopy images confirmed that the passage of the emulsion through the atomization devices decreased the thickness of wall material of the droplets with respect to the original emulsion. It was concluded that, in the proper design of the final products prepared by atomization it must be considered its effect on the stability of the atomized emulsions by including during the processing, a suitable sampling-characterization on-line scheme.